NEW the V2.0 Sabre mount now includes a 30mm precision Japanese bearing for even smoother panning, and higher capacity than the original version. If you want your v1.0 upgraded, please get in touch. The Sabre has a smooth action which can be controlled via the Alt and Az clutches, and a special friction dampener to make it easy to slew to objects by hand with the mount decelerating smoothly to a stop, just like some well made Dobsonian telescopes. This mount let's you enjoy a "Dobsonian" user-experience with your compact high quality refractor or favourite well Newtonian optical tube. It doesn't require any electricity and should civilisation collapse you'll be safe in the knowledge that you can still enjoy astronomy - possibly under even darker skies! For those who don't want to use electronic gadgets but who just want to enjoy "manual" observing with a refractor for example, this is the mount to have. The mount comes with a long and a short arm for attaching dovetail clamps which hold the telescope. The long arm is used for larger OTAs which need to stay further away from the mount centre in order to clear the tripod for zenith viewing. The shorter arm is for smaller telescopes. The Sabre mount basic model does not come with clamps, they are an optional extra depending on your choices. The Sabre is backwards compatible with all Altair Astro TMS dovetail clamps, however it also fits other clamps on the market, and has a 35mm M6 threaded centre to centre hole on the end of each arm for this purpose. We recommend the Altair TMS Vixen-format, Losmandy-format and Universal clamps or a combination of them, one on each side, because they will not mar or damage the rail or plate on your telescope and they are secure and easy to use, plus they fit in the design rather nicely. You can attach any Altair TMS range clamp to either side of the mount. You can order the TMS dovetail clamps in the related products tab below. A stainless steel counterweight shaft is available separately with a 20mm OD and machined end stop, to fit the counterweights offered with the Skywatcher EQ3-2, EQ5 and iOptron iEQ30 mounts. You can order a Counterweight shaft in the dropdown menu before ordering. You can order the Skywatcher EQ3-2 counterweights in the related product tab below. 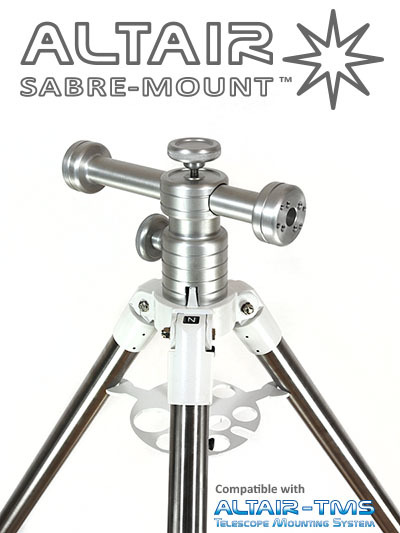 Tripod compatibility: The Sabre mount fits the Skywatcher HEQ5, EQ5 and EQ3-2 tripod directly, and most tripods with an M10 centre bolt protruding upwards, such as various models by Berlebach, Vixen, Meade, Celestron and other manufacturers. If in doubt, email us a drawing with dimensions and we'll check for you. You can order the Skywatcher steel tripod on it's ownin the related product tab below. Weight: Mount head approx. 3.2kg. Capacity: Exact capacity is unknown - but we suspect it will exceed the carrying capacity of the EQ5 tripod, and we have tested it with a 6" refractor and a 10" metal tube Newtonian, with the equivalent weight in counterweights on the other side, without any problems. Although it probably could handle more weight, we officially recommend scopes such SCTs up 11", metal tube Newtonians up to 10", and refractors up to 6". At these sizes you should be using the Losmandy format dovetail clamps and quality ones like the Altair TMS at that. We wouldn't recommend budget clamps with these size OTAs.